Chairside Economical Restorations of Esthetic Ceramic or CEREC® for short is a new state-of-the-art method of reconstructing tooth restorations. CEREC® uses computer-assisted design (CAD) and computer-aided manufacturing (CAM) to offer single-day restorations for patients. This new technology has revolutionized ceramic restorations such as crowns and veneers for patients so that there is no longer a wait between preparing the restoration and finally receiving the finished product. 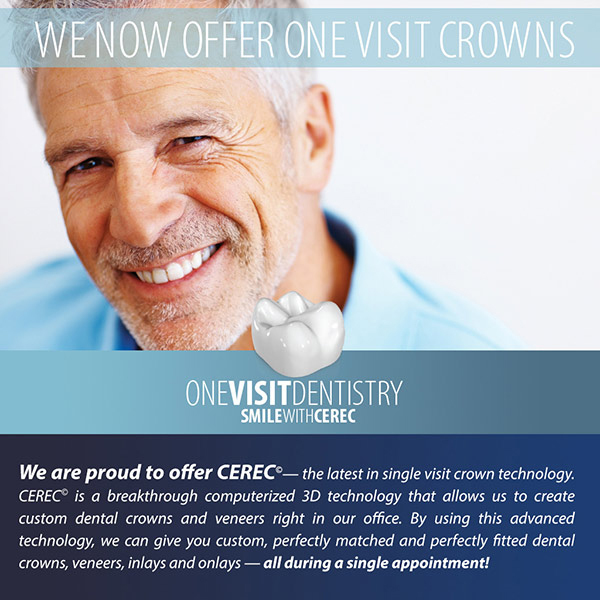 With CEREC®, the technology is used while you are sitting in the dental chair. The restorations created are metal-free and tooth colored to restore your tooth to its natural beauty, strength and function. With CEREC®’s CAD-CAM technology, these ceramic restorations can all be done in one single visit to the dentist. Before you get started, Dr. Mallouk will determine if CEREC® is right for you. After reviewing your options, Dr. Mallouk will begin the process by administering anesthetic and preparing your tooth for restoration by removing decay and weakened tooth tissue. In order to make the desired restoration, a 3-dimensional image of the tooth that needs to be restored must be created from a digital camera scan of the tooth. This three-dimensional image will be used to create the restoration without the need to take a messy impression. The computer and CEREC® 3D software then converts the digital image into a three-dimensional virtual model of the prepared tooth. This device is used to create the custom restoration needed for the tooth. Based on the original color of your tooth, Dr. Mallouk is able to select the correct colored ceramic block and in a few minutes, the milling device is able to create the restoration needed. After the restoration is made, it is ready to be tried on to ensure that you get proper fit and bite. 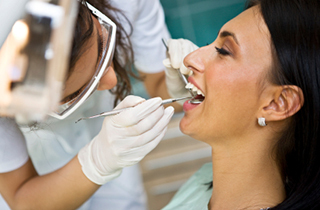 When it is ready, the restoration is polished and bonded into place by Dr. Mallouk. Therefore, no temporary restoration is needed and no return trip is necessary, saving you time and money. I felt so at ease visiting this practice, the staff is attentive and easy to talk to. Great Experience! After my first cleaning, my smile went from dull to radiant. Definitely recommended. As a parent, I highly recommend this practice for taking care of my entire family‘s dentistry needs. For more patient testimonials and reviews, please click here.